You will be given a reference e-book to read which has 241 pages And the test will be based on that e-book , you can take final test within 1 year of purchase. Financial analysis which is also popular for its other names analysis of finance and accounting analysis can be defined as a process which involves assessing the profitability, stability and viability of a project, business or sub-business. This process is executed by a professional who knows exactly the procedures involved in preparing reports with the help of ratios taken from all the vital information present in financial statements and any other financial reports. These financial reports are usually given to the top management of an organization as a means of helping them make the most informed business decisions. Successfully carrying out the financial analysis process actually requires a comprehensive knowledge about finance and accounting. The results of the analysis will help business owners and top managers to make decisions related to continuing or discounting the business’ main operations, creating or buying specific materials to manufacture products, renting/leasing or acquiring equipment and machineries needed in producing goods, issuing stocks or negotiating for bank loans with an aim of increasing the organization’s working capital and lending capital or investing decisions. Experts also define financial analysis as a vital organizational process which involves the evaluation of projects, businesses, budgets and any other entities that are related to finance in order to identify their suitability for investment. The process also involves analyzing the stability, liquidity, solvency and profitability of an entity. Most financial analysis experts focus on analyzing balance sheet, cash flow statement and income statement when it comes to carrying out their tasks. It also works in extrapolating the previous performance of an organization to predict its future performance. If your aim is to become an expert in understanding the financial health of an organization to better analyze its performance, stability and profitability, then the financial analysis certification course which is now available at Brainmeasures can work suitably for you. Brainmeasures financial analysis course works effectively in helping you analyze the financial performance of an organization so you can continue to positively respond to the somewhat stringent requirements in financial reporting at present. As a very reputable online certification company, you can expect Brainmeasures to offer you a more comprehensive financial analysis training which uses a more efficient approach when it comes to instilling in you all the knowledge and skills that you wish to attain to become a more effective financial analysis expert. With Brainmeasures, you can expect nothing but the best considering the fact that all its programs are developed by real professionals and experts in the industry. The entire financial analysis certification program can also be expected to cover all the areas associated to the process including financial performance management, budget analysis, cost analysis, revenues analysis, cash flow analysis, expense analysis, accounts receivable analysis and balance sheet analysis. The program also comes with a professionally developed financial analysis exam which you need to pass before your financial analysis certificate will be given to you. 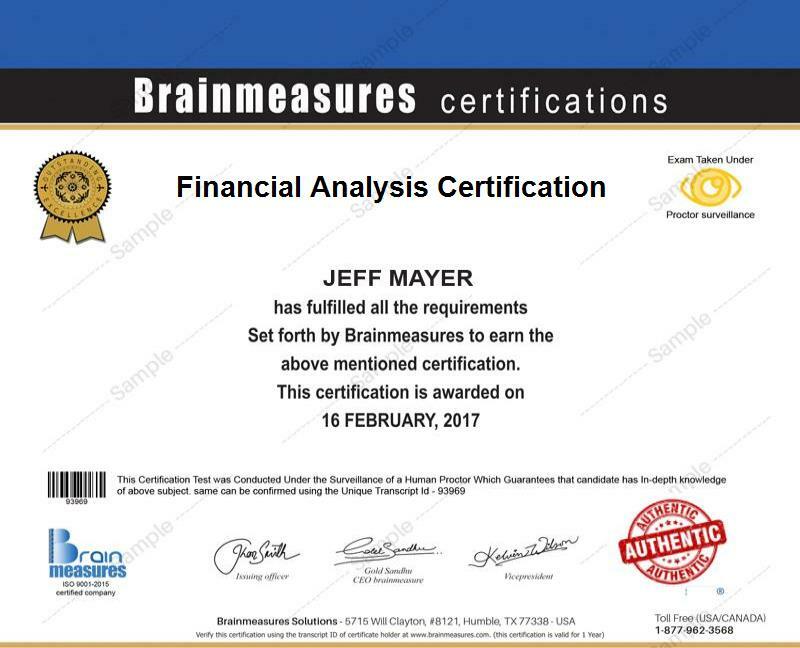 Taking up the financial analysis certification program offered by Brainmeasures is beneficial in the sense that it allows you to completely understand the process of analyzing the financial performance of an organization. The certification course is ideal for existing financial analysts, financial analyst managers, advisors and consultants who want to gain a better understanding about the financial analysis field so they can improve their career, professionals who are part of the financial analysis department or team of an organization and business managers who use financial information in formulating the soundest decisions. If you are planning to enroll in a financial analysis certification course and complete it, then be aware that working as a financial analysis expert gives you the opportunity to improve your present financial condition and stability. Being a holder of the financial analysis certification allows you to enjoy an average annual salary of $72,000 plus bonuses and any other remuneration benefits.